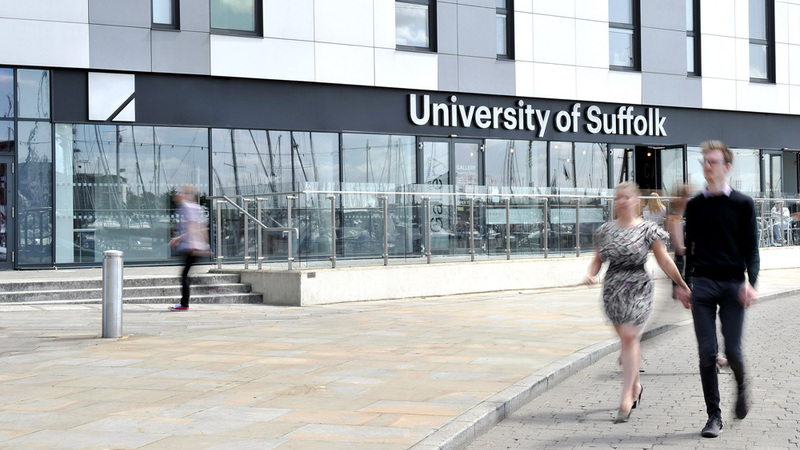 Established in 2007 University Campus Suffolk was a collaboration between the University of Essex and the University of East Anglia, who were the two validating universities that granted degrees to its students across two faculties: Faculty of Arts, Business and Applied Social Science and the Faculty of Health and Science. In 2015, it was granted Taught Degree Awarding Powers by the Quality Assurance Agency for Higher Education and earlier this year it was awarded University status by the Privy Council; the only applicant to receive the status this year. 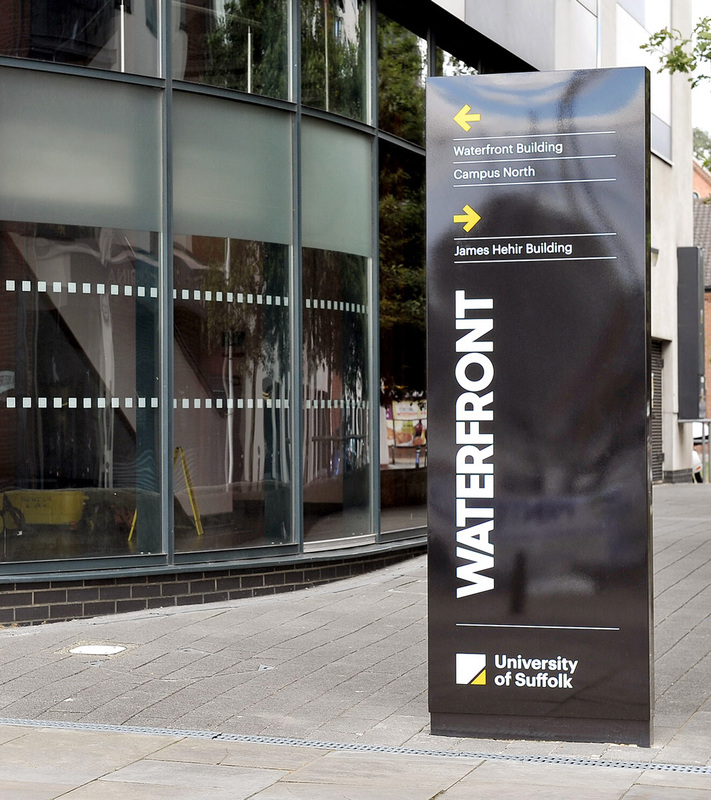 Now known as University of Suffolk, it is the only tertiary education institution in Suffolk, UK, and counts with nearly 5,000 students across five sites in Suffolk county. 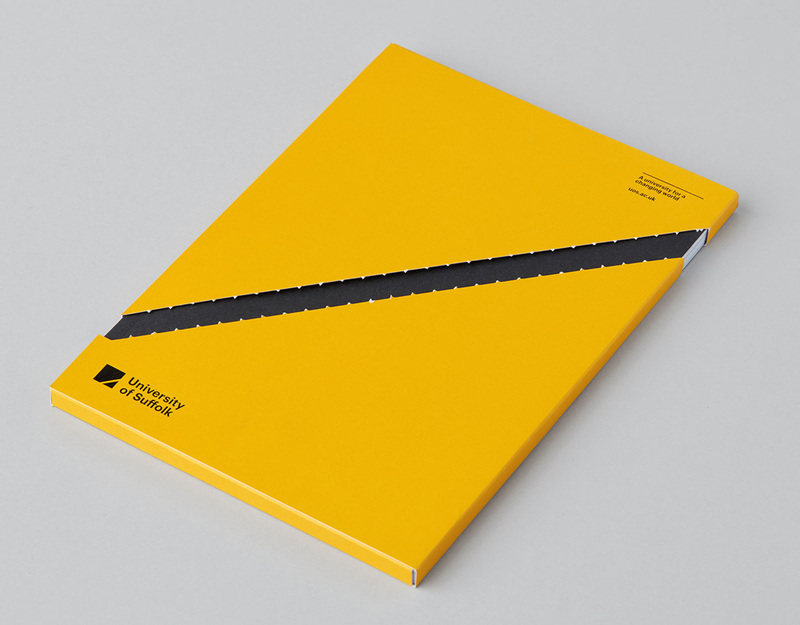 The new identity has been designed by Leeds, UK-based Only Studio. 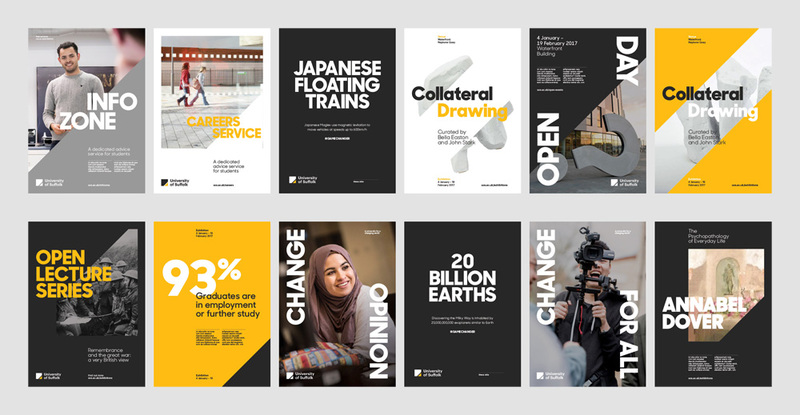 Following extensive consultation with stakeholders, our priority became crafting a bold, contemporary and flexible system to accommodate the many faces of the University. A forward facing angle is used throughout the identity to reflect progressive change, and to create reference to the University’s location in the South East of England within the logo itself. The device is paired with a modern palette and confident typographic applications. The old logo was cheesy, looking more like a place to learn HTML1 than a university or, as it were, a funnel for two universities. There wasn’t anything offensive about it and it was relatively properly done but it came across as a cheap alternative to education. The new logo is remarkably confident in its minimalism. A square with a triangle highlighted by a cut? That’s bold. Especially for a new university with a new name. Even without being overly familiar with the geography of the UK the moment I saw the logo I thought it was pointing to its relative location. It’s not a logo that makes me smile or jump for joy in any way; it’s as dry as a textbook cover but I really like the simplicity and proper balance it has with the wordmark, which has the perfect length of characters to break into a nice, pleasantly ragged two lines of text typeset in Commercial Type’s Graphik. As you would expect, the angle of the logo is a recurring element in the identity but it’s used in a fairly subtle way that doesn’t become grating in long doses. The angle is offset by bold typography, sometimes angled vertically. Again, nothing earth-shattering, just well done, well balanced, and nicely color-coordinated in black, yellow, white, and shades of gray. The one thing that bothers me is that the headline typography is set in a similar sans serif that’s different but not quite different from the logo, Sharp Sans. It looks great — that isn’t the problem — but, to me, it short-circuits the relationship between logo and applications. The prospectus is what sold me on posting this project. Clever use of a tearaway. 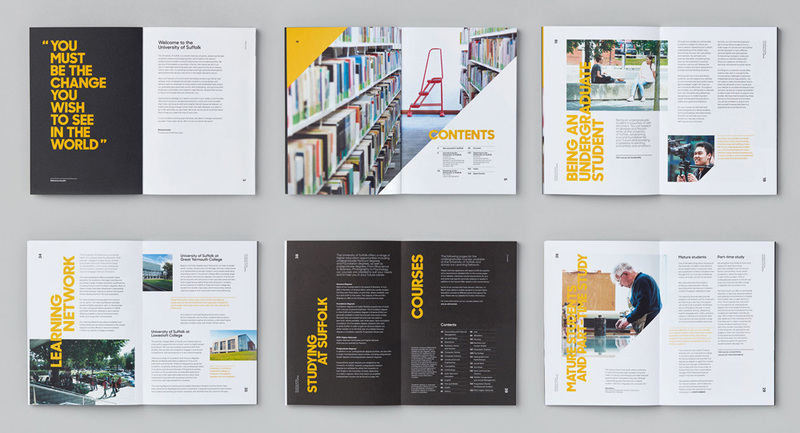 Overall, and not to sound too repetitive, the identity doesn’t have a wow-factor — and it’s not that it needs one, it’s a university after all — but it makes up for it with a steady, consistent, mature, and confident visual language.